Hi everybody! 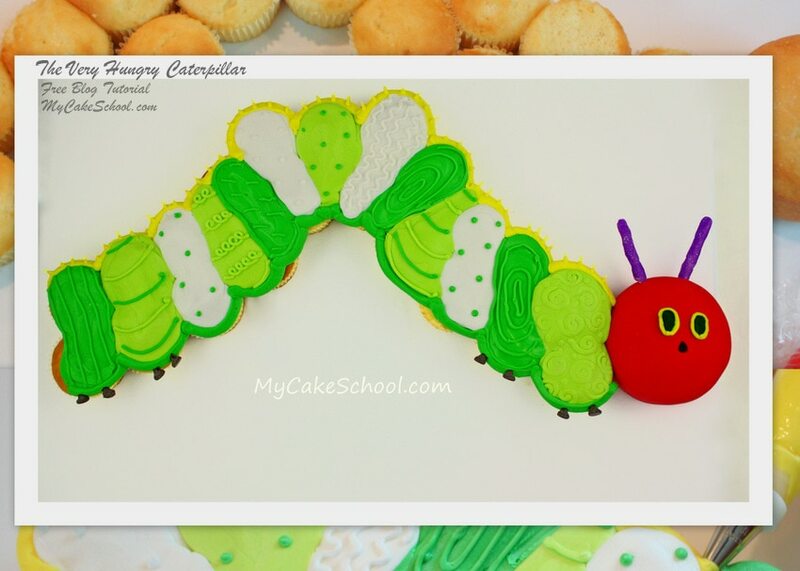 Today I am celebrating one of my favorite children’s books–The Very Hungry Caterpillar (by Eric Carle). 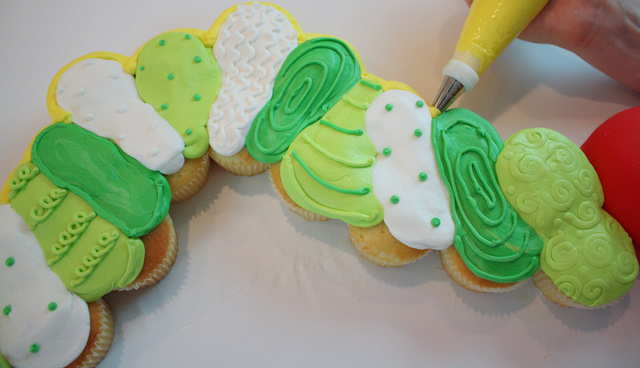 I’m going to demonstrate how to make the most adorable Caterpillar Pull-Apart Cupcake Cake! This sweet little hungry guy seems to be making quite a comeback. Lately I’ve seen birthday party themes, toys, and even Hungry Caterpillar children’s bedding–(See Pottery Barn Kids–The Cutest!!!) — So, the time has come to cupcake-cake him…. you will love it! In case you’ve never made a pull-apart cupcake cake, you’ll want to make sure to add a dot of icing to the bottom of your cupcakes–this will help them to stay put. Notice the head that I added to the end– it’s a 4″ round. You’ll also want to stagger your cupcakes so that they are nicely nestled next to each other—we don’t want any large spaces in between. This feels a bit like assembling a puzzle! 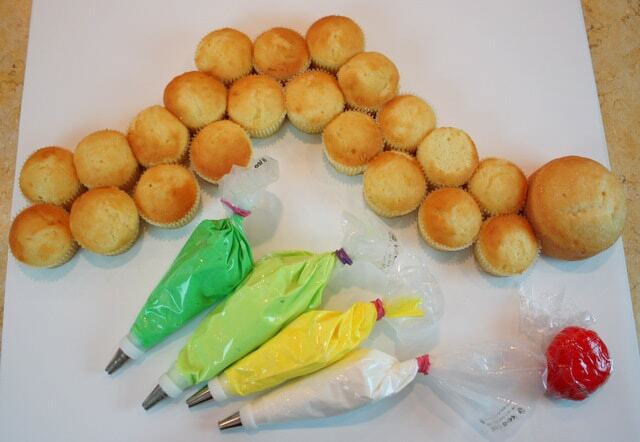 I’ve loaded up my piping bags with a medium consistency crusting buttercream–and fitted them with a piping tip 12. 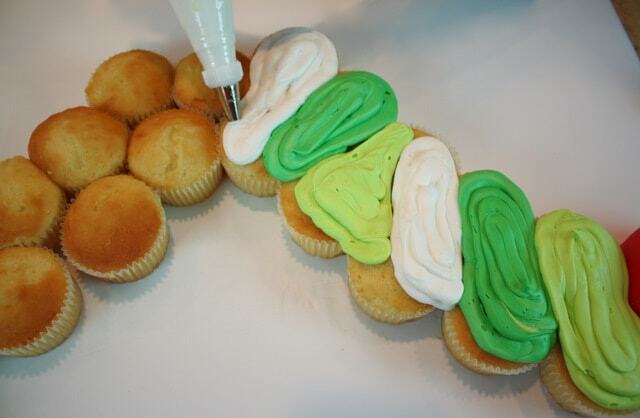 Here, I’m piping over the cupcakes wtih alternating “stripes”. I’m somewhat staying within the color scheme of the actual caterpillar from the story–but not exactly. Now, I’m smoothing over my slightly crusted buttercream with a piece of a Viva brand paper towel. This is an optional step, but I like the smooth finish. Some of my stripes are pretty chunky and thick–I wanted to add a little extra dimension. Remember when I said that I wasn’t going for the exact look of the caterpillar from the story? Well… now you’ll really see what I mean. I love patterns–and I love piping! :0) — I think that our caterpillar needed a little extra pep! All of my piping is done with a tip 3 or 4– with the exception of the outlined border on top and bottom—that is done with a tip 12. 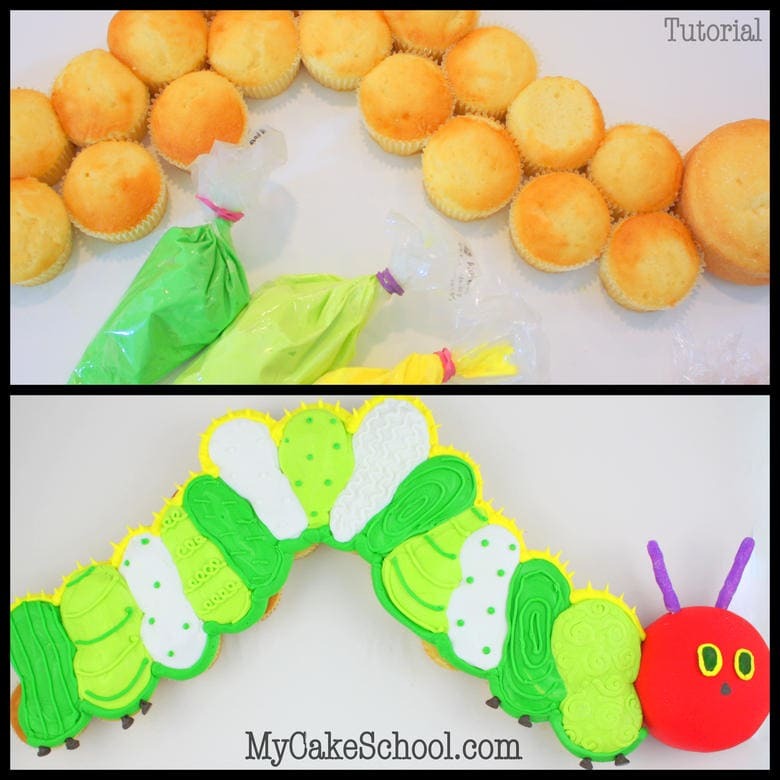 Now, time to make our caterpillar really look like a caterpillar! Earlier, I covered my 4″ cake with some pre-colored red fondant. 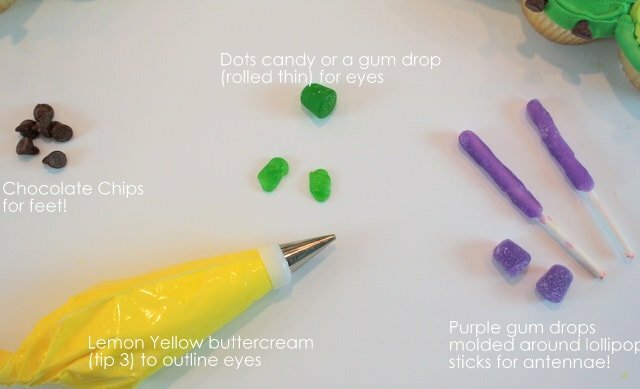 If you are not a fan of fondant, you could also use buttercream. That’s all there is too it! Are you ready? Here he is! Hi Gemma, we used a 24 x 24 board, there is more information on this in the above post dated Sept. 1, 2011. Thanks for answering my query before, I am going to make the cake in 2 weeks time.. just wanted to have a trial with the frosting, what is 2 teaspoons (8 gr) vanilla, clear vanilla for a whiter frosting… is this vanilla bean or essence?? I live in Australia so might be called something else! Thankfyou for you guidance and assistance.. The cake was a winner! Would love to send u an image!